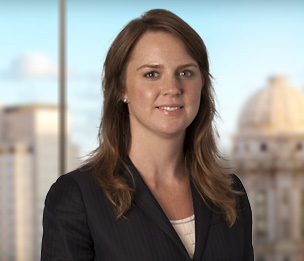 Molly Thompson, a member of the firm’s Business Litigation Group, has broad litigation experience in state and federal courts. Ms. Thompson has successfully litigated on behalf of a variety of clients, including financial institutions, municipalities, product manufacturers, public officials, individuals and corporations through retention by insurer, and other professional individuals and entities. Ms. Thompson concentrates her practice in consumer financial services, civil rights litigation, complex commercial and contract disputes, personal injury, and business torts. Ms. Thompson has tried jury cases in federal court and is an experienced appellate attorney, having prosecuted and defended many appeals in state and federal courts. Prior to law school, Ms. Thompson worked for the Manhattan District Attorney's office in the Investigations Division, where she assisted in the prosecution of money laundering, securities fraud, and corporate crime. Defending corporations and individuals, directly or through retention by an insurance carrier, in personal injury litigation. These include, for example, cases wherein Ms. Thompson successfully defended insureds, through motions to dismiss or for summary judgment, against claims of negligence arising out of alcohol or drug-related deaths at their home and a case wherein Ms. Thompson filed a successful motion to dismiss on behalf of an insured sued for defamation and related claims arising from comments made in the course of divorce proceedings. Defending municipal corporations against policy and practice claims, individual municipal officials against supervisory liability and other claims, and police officers against Section 1983 and malicious prosecution lawsuits. Representing mortgage servicers in actions alleging TCPA, FDCPA and FCRA claims and violations of bankruptcy discharge injunctions. Representing financial institutions in litigation related to REO property. Representing a retail fashion company in a series of copyright enforcement actions against online competitors. Defending professional entities and individuals in privacy tort litigation. Defending and prosecuting other types of commercial claims, including breach of contract, breach of fiduciary duty, and other business torts. Representing several pro bono clients in receiving asylum in the United States. Representing a pro bono client subject to removal proceedings in a Seventh Circuit appeal, resulting in a reversal of the Board of Immigration Appeals judgment on an issue of first impression. "Relocating from the Distress of Chicago Public Housing to the Difficulties of the Private Market: How the Move Threatens to Push Families Away from Opportunity"